Gamasutra: Daryl Hornsby's Blog - Has the DLC situation really gotten this bad? 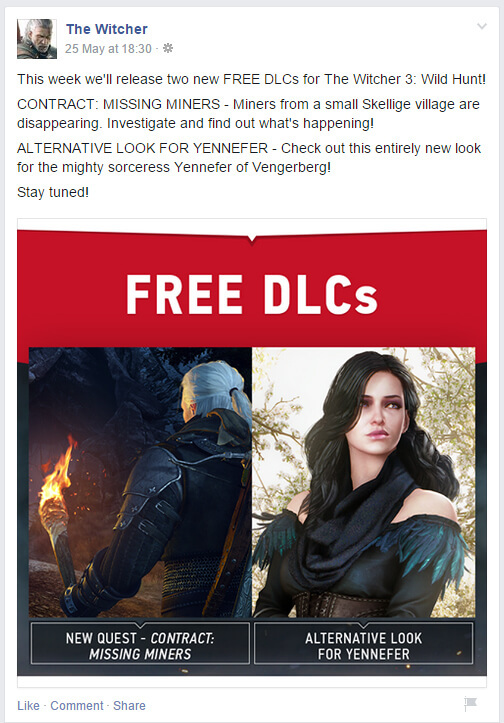 Updates, For Free, and advertising Witcher 3 DLC. Has the DLC situation really gotten this bad? Updates, For Free, and advertising Witcher 3 DLC. 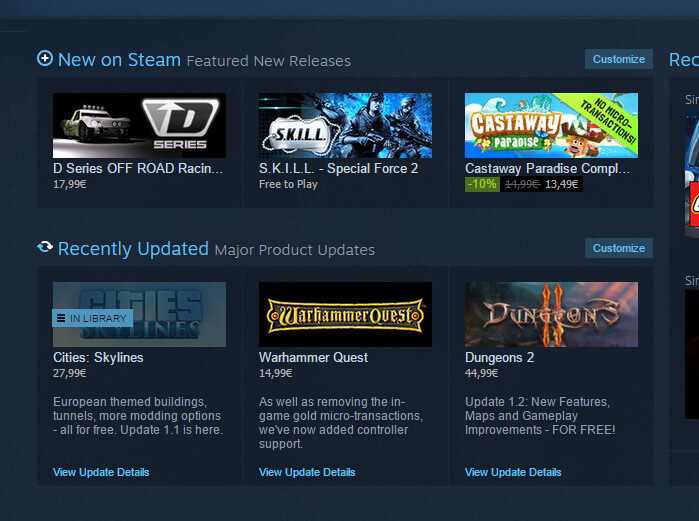 I loaded up Steam last week and saw the Recently Updated section on the store front page. I love Cities: Skylines, and I really can't wait to play with the tunnels. But both Skylines and Dungeons 2 advertise these updates - in this tiny amount of text - as free. As if it's something outside the norm. Are free updates really a selling point now? This also got me thinking about something I saw over on GOG: the Witcher 3 "Free DLC Program". I appreciate free content, I can't imagine anyone not, and CD Projekt Red got a lot of positive responses from players and press back in November 2014 when they announced this. A quick look at the comments on articles from GameSpot or Kotaku shows just how frustrated some players are with expensive and gratuitous downloadable content in other games. But why isn't CD Projekt Red just updating Witcher 3 with this content? Why are these download packs instead of just options that can be toggled on and off within the game? I'm assuming it's for the free press and praise they're getting, and if it is, it's working. "YOU GUYS HAVE NO SHAME!! You want the whole gaming community to love you and YOU ARE NOT EVEN HIDING IT!!! And guess what??? You are succeding[sic]!!!" But this is the corner our industry has found itself back into. Games can be praised for not charging for something that, ten years ago, probably wouldn't have cost anything anyway. This is a selling point for the games, and it's bringing player loyalty to CD Projekt Red. But look back above at the Steam screenshot. Cities: Skylines might have been an odd choice for DLC, but "European themed buildings" is exactly the kind of feature players are now used to paying separately for. I want to be clear: I love Cities: Skylines and Witcher 3, and I don't think badly of the developers for advertising their games like this. But I don't like the fact that we're in a situation where developers can do this simply because it's bucking a trend which frustrates players and where publishers try to milk them for more cash. Quests. Small missions, that typically don't have a lot of new content in them. You can find many examples of all these types in games. The Elder Scrolls V: Skyrim is notorious for selling cosmetic horse armour (something CD Projekt Red satirizes in it's first free DLC package), Evolve was announced with a mass and mixture of these DLCs. Expansions are available for games such as Skyrim, The Sims, Command and Conquer - at Jess notes, generally PC-focused titles. The advertising for this is pretty standard. The name, how long it takes, what's in it - without spoilers. If we take a look at the announcement for this week's DLC releases, it's focus is entirely different, though a lot smaller. The gameplay package here is introducing a single new quest, but the advert doesn't talk about how long it takes to complete, it's simply a teaser for the story. There's not a lot of information, but what little there is has now available all over the web, on every gaming news outlet. One new side quest is not a lot, especially since the game seems to already contain hundreds of quests (literally, actually). This kind of content is cheap and easy to produce, and was probably made after the game went gold and the developers had some downtime. It would've cost CD Projekt Red nothing to produce, and so they're giving it away for nothing. By giving away 2 such items every week, Witcher 3 gets free publicity from every gaming website with any relation to PC, Xbox One or PS4, every week for eight weeks. Every week, players who own the game will be prompted to return to it, drawing them in and trying to hook them for the paid Expansion Pass; and non-players will see another advertisement for the game. And this isn't a bad thing. Developers and publishers need to sell their games and the want people to play them. When I work on a game, I do whatever I can to help sell it. The disgusting thing is the reason why this is news. Advertising your game with "Free DLC" and "Free Updates" works because players are now used to paying for everything. If we look at Evolve, Destiny and Batman: Arkham Knight, potential customers are being asked to pay money upfront for games and Season Passes up to a year before they even know what the game is like or, sometimes, what's even included in the pass. Middle-earth: Shadow Of Mordor received great reviews and scores, but it's DLC was disappointing and unfortunately many players had already handed over their money months before they knew what the DLC actually was. If the DLC plan for Witcher 3 was the standard plan for the industry, this wouldn't be newsworthy. Building on this, let's take another look at how the Expansion Pass is being sold. 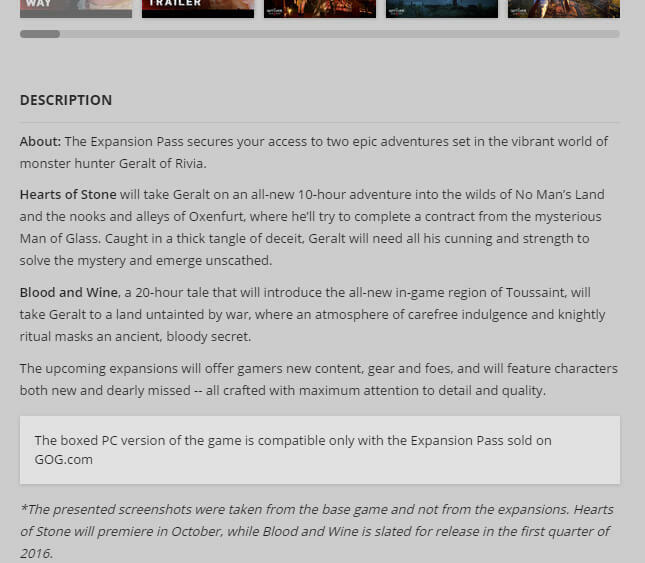 The first line describing each expansion is primarily advertising the amount of time the content should take a player to complete. The rest teases what the pack actually contains without spoiling any of the details. First thing: expansion length. Judging by The Order: 1886's 'controversy' about game length, it seems that the length of a game is the quickest measure of its value.Whenever somebody buys a product, they should feel they've received value for their money. When you advertise a game, you need to demonstrate your game has such value. This is a number potential customers look for, and that itself is a sad statement. We saw this ourselves with our premium mobile puzzle game Machineers, which we priced at $5 per episode. Each episode takes a minimum of about 90 minutes to complete, though some spend a lot longer on each, and some are faster. Some of the reviews we had criticised the amount of content versus the price. That's a fair comparison fora customer to make if you feel you haven't gotten equal value to what you put in. Of course, then you get some players defending your game, and that feels great. It's a subjective thing and thus it differs for every player. So while some (or most) AAA publishers are trying to get potential customers to pay more money sooner, and may even be cutting content from the main game to sell on later, CD Projekt Red is building hype and a loyal consumer base by doing the opposite. Today it was announced that The Witcher 3: Wild Hunt has been the biggest UK launch so far this year. By looking at what the big publishers are doing and opting for the opposite, CD Projekt Red has created headlines that have reached a consumer base that would otherwise not have paid it much attention, no matter how interesting, engaging or fun the actual game is. By leveraging content made by artists and programmers in the downtime after the game is feature complete, content that costs them nothing since that employee time is already paid for, CD Projekt Red has boosted boost the image of a game and its developer/publisher and left EA and Battlefield: Hardline in the dust. An update on Steam is described as "Free" simply because we're used to downloads costing, but I have no idea if it's helping Cities: Skylines sales. And don't even get me started on pre-orders.